Moira Lake visitor precinct is situated within the Murray Valley National Park and Murray Valley Regional Park. Both of these management areas were created by the State Government in July 2011 and involved the consolidation of a number of former state forests with the aim of protecting the majestic river red gum forests of the Riverina’s Ramsar-listed wetlands. In 2012 Environmental Partnership were commissioned to develop strategies to improve opportunities for tourist visitation of the Moira Lake area, building on existing bird watching and camping activities. 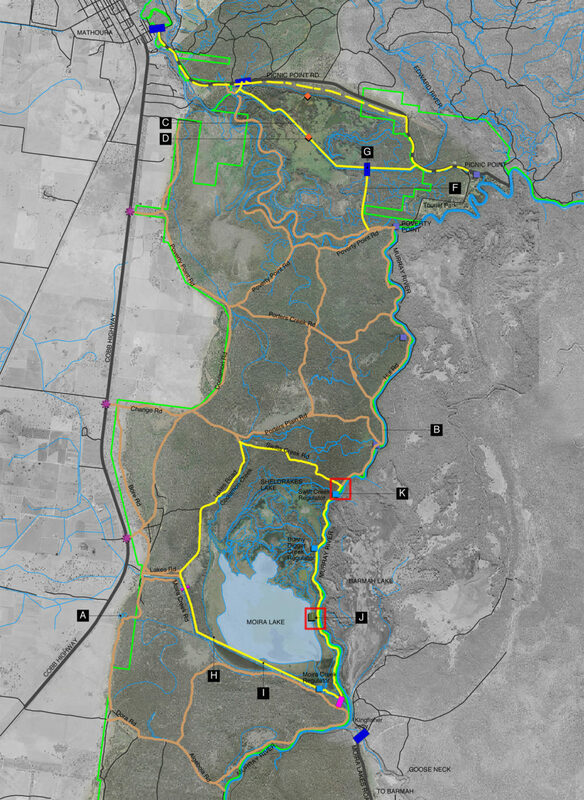 The resulting plans highlight two hike & bike trails along wetland environments and a scenic drive through the park along the Murray River to the Swifts Creek Rest Area. The Swifts area will be upgraded with picnic / barbeque facilities and a small boat ramp. The precinct will provide a starting point for the hike & bike access to Moira Lake. Both hike & bike loops will feature bird hides, viewing and rest areas and interpretive information. The proposed bird hide at The Breakaway will also have water access via the Murray River.